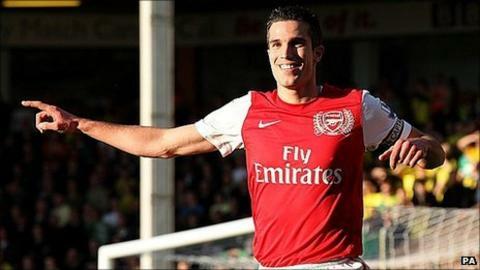 Robin van Persie took his 2011 Premier League goals tally to 31 with a match-winning brace at Norwich to earn Arsenal a 10th win in 12 matches. The Dutchman, in prolific recent form, was again the difference to reward a vibrant attacking Gunners display. He grabbed his first with a tap-in from Theo Walcott's cross and clipped in a superb second from Alex Song's pass. Steve Morison had pounced on an error by Per Mertesacker to give the hosts an early lead but they could not hold out. It looked for a while as if the Canaries might, however, thanks partly to a stoic defensive display and partly due to the Gunners' profligacy. Time and again in the opening hour of the match Arsenal cut through the Norwich team with swift and accurate passing and, most notably, the pace of Walcott on the right, but time and again the Gunners failed to convert their chances. In the first quarter of an hour alone, Arsenal could have been two or three goals ahead, Gervinho having a shot blocked, Van Persie scuffing wide when well placed and then Walcott denied a goal by a simply stunning goalline clearance by Russell Martin. And the visitors were made to pay for their failings in front of goal when Norwich took the lead completely against the run of play, Morison stealing into the box when Mertesacker dallied unnecessarily on his clearance and sliding into the corner. Arsenal boss Arsene Wenger complained of a foul on his German centre-half, but his appeals were unsuccessful, quite rightly. The Gunners continued to pile forward despite the goal, however, and unbelievably it took two more goalline clearances from Martin - the first from Van Persie's header and then when keeper John Ruddy could only half-stop Gervinho's effort one-on-one - to keep Norwich ahead. Arsenal finally broke through on 26 minutes, however, the effervescent Walcott flying past Marc Tierney and crossing for Van Persie to tap in from six yards out. With Aaron Ramsey getting forward at every opportunity and Van Persie virtually unplayable up front, the Gunners continued to threaten thereafter. Gervinho was the most frequent beneficiary of some fine Arsenal build-up play, but the Ivorian was unable to convert a host of chances, most notably after being put through on goal by a wonderful Van Persie pass, allowing Ruddy to save despite having apparently rounded the Norwich keeper. Van Persie was not nearly as wasteful, though, and he grabbed what turned out to be the winner on the hour mark. Martin, so solid throughout, made a rare - and costly - mistake in losing possession on the halfway mark and Song pounced to release Van Persie, who strode clear before chipping a delightful finish into the corner. It was the Dutchman's 10th goal in his last five games and was to ensure a dominant Arsenal performance would not go unrewarded. Norwich continued to battle gamely and they might even have snatched a point had Anthony Pilkington not scuffed Elliott Bennett's whipped cross six yards out with the goal gaping on 66 minutes. But as it was, Arsenal saw out their victory relatively comfortably, going closest to extending their lead late on when Walcott's rising drive crashed back off the outside of the post. Norwich boss Paul Lambert: "Arsenal are a very good side and deserved to win on the day. But it's another learning curve for us as we try to aspire to that level. "We were always in the game today which is pleasing. "We got off to a good start, Steve's goal lifted the crowd but Arsenal came back strongly and you can see they are a very good side." Arsenal manager Arsene Wenger: "Robin [van Persie] is exceptional but we all know within the club that he's an exceptional player. Sometimes, what was in the way was the fact he was injured. Since he plays, he shows just how good he is. "[As a team] we have shown our mental strength again today. "It's down to team attitude and confidence, as well. There is a good attitude and spirit in the squad."